Have you spotted the awesome new addition to Meadow Park Sports Centre yet? 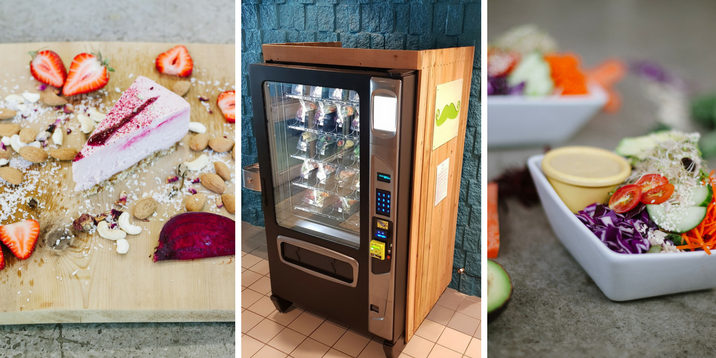 Now you can get your favourite Green Moustache Organic Café meals and treats to enjoy right after your workout/swim/skate/fitness class from the new Green Mo’ vending machine. The new Green Moustache vending machine offers their Superfood Salad, Buddha Bowl, Veggie Wraps, Raw Pad Thai, a Kids’ Snack Pack and a selection of their decadent vegan desserts. Yum! Not only is the new vending machine fuelling visitors to the sports centre, it also means you can buy Green Moustache food outside of the Whistler café hours, as Meadow Park is open from 6am to 10pm. So if you’re in need of some early morning nourishment, or want to grab a mouthwatering vegan meal for dinner, all you need to do is drop by the sports centre. The vending machine is restocked daily so the food is as fresh and fabulous as it is in the café itself. Hopefully this will be the first of many to come. How amazing would it be to see vegan vending machines in every sports centre across Canada?! Visit The Green Moustache Organic Café website for more info.